Venice attraction-guides.com - Venice, Italy attractions guide Venice Burano Island, region, Mazzorbo information about attractions, fishing, lace marking industry, museum, parks, ferry journey, Mazzorbo, restaurants, location and address, general tourist information about Burano Island in Venice (Venezia) area, Italy (Italia) IT - Last updated 30/10/2012. The busy town of Burano, close to central Venice, contains numerous streets lined with brightly coloured houses. Famous throughout Venice and Italy for its fishing and lace industries, Burano is near to Venice and can be easily reached by ferry, with the journey lasting around 40 minutes. Attractions at Burano island, nearby Venice, include some splendid parks and the Museo del Merletto di Burano, a lace-making museum which is open daily (except for Tuesday) from 10:00 to 17:00. Original Burano lace is very expensive, although these days there is also a wide range of cheaper imitation lace that is imported from Asia. 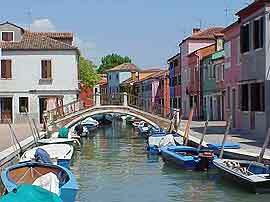 Most people that visit Burano do so as part of an excursion from Venice, that also stops at Murano and Torcello. Whilst in Burano, be sure to cross over the wooden bridge into neighbouring Mazzorbo - which is a much larger island containing only a small number of houses, a couple of restaurants and a huge amount of open green space.